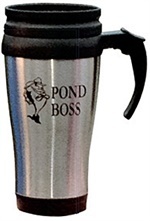 Heavy duty large stainless steel coffee mug, with our Pond Boss logo. You will love this travel mug! You can even take it on the boat. ORDER TODAY! 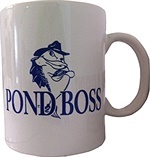 Heavy duty large white coffee mug with Pond Boss logo. Great to drink your coffee in while you watch the sun come up on your dock. ORDER TODAY!